by JH3LFL and has been working now. Now 2003-2015 CW SSB certificates are available. Please QRX for 2016 CW/Phone certificate. Since we lost the sponsor for JIDX. The plaque program is not running yet. 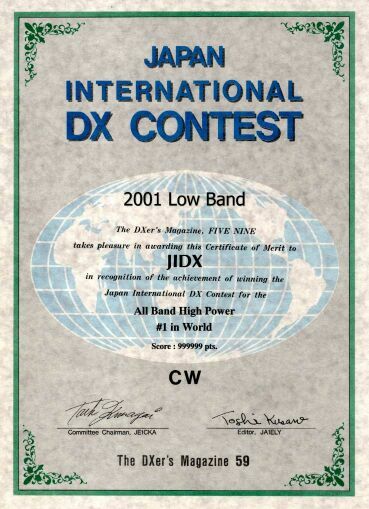 Please indicate "JIDX Contest #Year #Mode #Your-callsign"
You should watch here for further informations. Please QRX for 2007PH photos. They will be added soon. please send them to the chairman for this JIDX-PhotoAlbum, Thanks. Here are the Super Check Partial file and Call History file for N1MM+ for DX stations. These files were compiled from past JIDX contests and JA domestic contests in Jan. 2019. "File" -> "Open Log in Database:" -> "Associated Files"
Don't forget to mark "Enable Call History lookup" of "Config"
2018-04-08: System trouble occured from 8th 00UTC and corrected at 15UTC. Five Nine magazine quit to support JIDX contest. Please refer Email-Log-Instruction for more informations. The following programs have been supporting JIDX contest and we committee recommends to use one of them. If you know any other logging software which support JIDX contest, please let us know. you to upgrade from N1MM-classic to PLUS now. You should chose "JIDXCW" or "JIDXSSB". Windows contest logger based on N6TR's source code. The look and feel are just like "TR". Over 260 TR LOG commands are already supported + 45 new. JA entrants - select SD's "JIDX, JA" template. DX entrants - select SD's "JIDX, DX" template. CtestWin by JI1AQY - runs on any WinPC and is free. JA entrants - select "Japan Int'l DX"
VKCL by Mike Subocz, VK3AVV. This fully supports JIDX for DX entrants. Sorry,CT does not support JIDX, and NO MORE official support. but you can use CT for the JIDX with this setup. 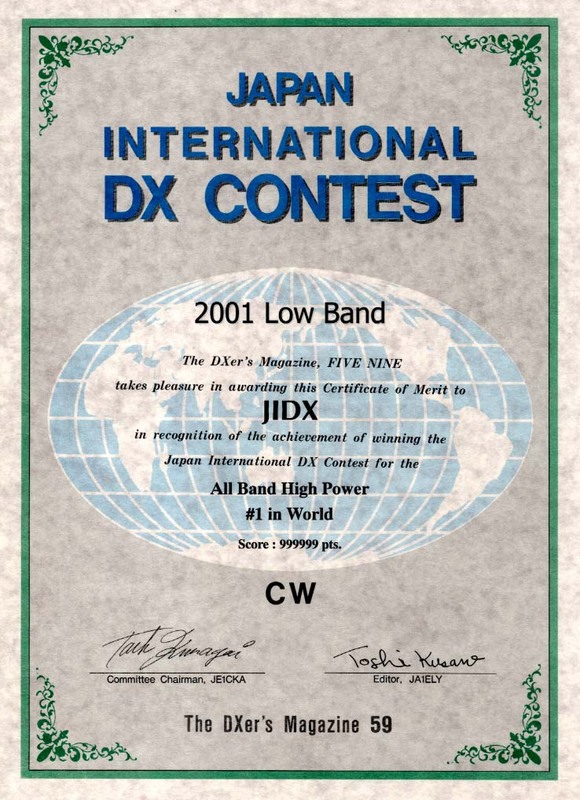 Set the contest type as "ARRL-DX DX-side"
Download the "ardxjidx.dat" and rename it as "ardxdx.dat"
good on Win2000/XP or later. but ADIF format, ADIF2CBR will be strongly recommended. would you send us the email to the following address?